While I am typing this blog entry, day three of the BART strike is highly likely. Assuming if both sides can hash out a deal very soon, BART won't be able to run at full force for at least a full 24 hours, which means whatever day they restart service, only some trains are going to run. Oakland/Alameda: $4.75 paid with Clipper. You'll pay $6.25 with cash. Harbor Bay: $5 paid with Clipper. You'll pay $6.50 with cash. Also, if by using your Clipper card, you'll also get a 50 cent discount to take Muni. Simply use the same Clipper card and you'll pay $1.50 for the Muni ride. When you take your return trip on Muni back to the Ferry Building, you'll also save 50 cents. 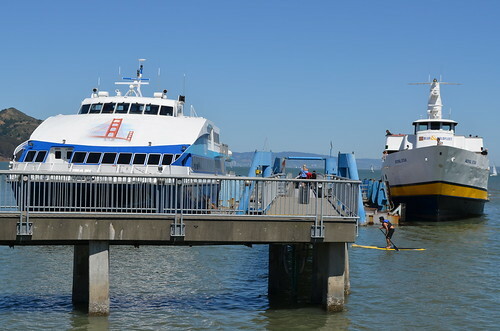 Similar to the discount with the above ferry services, if you take the Larkspur ferry, you'll also get a discount. You'll pay $6.25 on Clipper, versus paying $9.50 in cash. You also receive a 50 cent discount for Muni as well. Take Muni away from the Ferry Building with the same Clipper card and pay $1.50. When you return on Muni, you pay full fare ($2), but you'll get a 50 cent fare discount (on top of the $6.25 discount fare) upon entry to the Golden Gate Ferry system. I got some positive Twitter reactions from these suggestions. Why not try them out? Talk like a pirate, dress like a pirate, and be a pirate on the ferries! Sing some simple classic songs to ease that anger! Hopefully others can sing along too!